Galapagos Island and Peru make the most of your trip to the region by combining the natural wonder of the Galapagos Islands with the cultural, scenic and archaeological marvels of Cusco, the Sacred Valley and Machu Picchu. This option includes a 4 night Galapagos cruise with the motor vessel M/V Galapagos Legend, Panoramic windows not only allow you to observe your destination but also to be part of it. In its ample social areas you will be able to do countless activities. With only one hundred people on board you will enjoy exclusivity and a personalized attention. 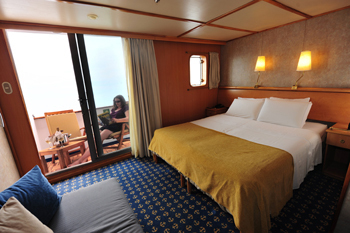 Enjoy the landscapes and view on any of the outer decks. Wet landing. Ballena (Whale) Bay is a beautiful green sand cove at the base of Dragon Hill on the west coast of Santa Cruz Island. The beach* contains a large amount of olivine crystals of volcanic origin. The crystals were formed when the magma was still underground. The content is magnesium, iron and silica. A small population of tortoises from Pinzón Island lived at the site, but were probably taken by whalers or previous inhabitants. Opportunity to see marine iguanas* and sea birds* followed by snorkeling. Dry landing. The main attractions at Punta Moreno are coastal lagoons amidst black lava flows* where bird life is particularly interesting. It has a panoramic view of three volcanoes, the most active of the Galapagos: Sierra Negra and Cerro Azul on Isabela Island and La Cumbre, on Fernandina Island. Mangrove forest, lava formations, coastal and migratory birds, usually flamingoes*, can be seen and the largest colony of penguins*, lava cactus, sea turtles, lagoons and tidal pools, candelabra cactus* are other highlights. We take a dinghy ride along the coast surrounded by mangrove forest for an opportunity to admire Flightless Cormorants*, Galapagos Penguins*, and a nesting area for sea turtles*. Wet landing on a volcanic “black” beach. Depending on the season, we may find giant tortoises*, land iguanas* and the unusual Flightless Cormorant. After a short walk inland, snorkeling time is allotted, giving you yet another chance to swim with sea turtles, sea lions and countless tropical fish. Urbina Bay features a wide variety of plant life that changes depending on the season. We can observe the beautiful colors of plants that attract different insects, birds and reptiles. We will explore the uplifted coral reef that resulted from 1954 volcanic activity, with a spectacular view of Alcedo Volcano. Dry landing on Galapagos’ largest island where we will learn about the eruption of the five volcanoes that form it. The trail leads to Darwin’s salt-water crater Lake and excellent views of lava fields and volcanic formations. We will return by the same path for a dinghy ride along a shoreline full of marine wildlife, where we will admire a variety of seabirds*, such as Blue-footed Booby, Brown Noddy, terns, Flightless Cormorant and depending on the season, a large number of Galapagos Penguins* which are only 35 cm. tall; the only penguin species in the world to extend its range into the northern hemisphere along the equator. They are monogamous and lay their eggs in small cracks of lava, on the lower parts of the island near the shoreline not reached by the ocean waves. “Pa-hoe-hoe” and “AA” lava formations* cover the majority of the terrain. Vegetation is thus scarce inland, but we encounter Brachycereus cacti and extensive mangrove beds lining the shores. Great deep-water* snorkeling at one of the richest marine havens on Earth (Bolívar Channel). We take a dinghy ride along the coast to observe a great diversity of sea and coastal birds*; Nazca and blue-footed boobies, noddies, brown pelicans, penguins, flightless cormorants. 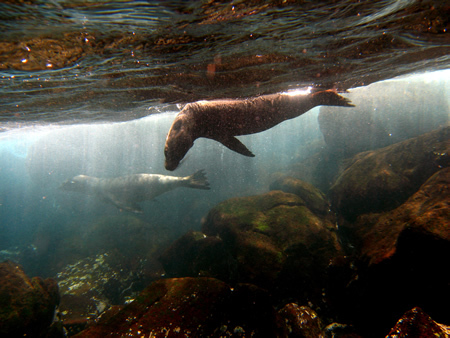 The upwelling of coldwater currents in this part of the Galapagos gives rise to an abundance of marine life. Dry landing. A 45-minute bus ride will take us to the Santa Cruz highlands, located to the northwest of Puerto Ayora, where we will find a natural reserve with giant tortoises. These enormous and slow-moving reptiles are responsible for the island’s name and therefore approaching them in their humid and forested abode is always an inspiring adventure. They can weigh between 250 and 300 kg and can live up to 150-200 years. 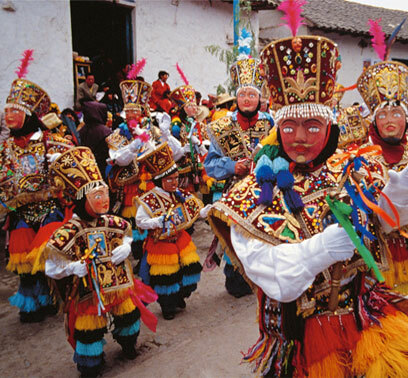 After the visit passengers will be transferred to Baltra airport for return flight to Quito. Day 11: Cusco fly back to Lima and back home. 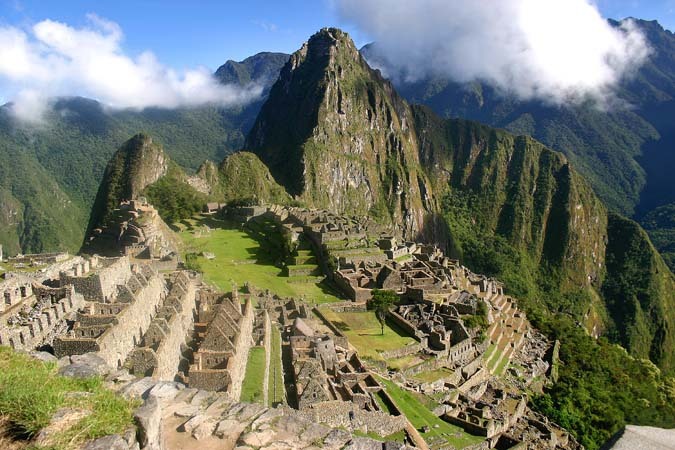 FINAL ARRANGEMENTS US$ UPON REQUEST: Prices start from $ per person in double occupancy from Lima, Peru. This includes all meals from Breakfast, Lunch and Dinner, accommodations as stated in the itinerary, accommodation in 3* & 4* hotels, domestic airfare, Flights from Peru to Ecuador, Flight from Quito to Galapagos Island, Vistadome Train in Peru, ground transportation during the tour, and guide services provided by our tour guide. It does not include airfare from your home to Lima and return from Ecuador, airport departure taxes, National Park Tax and Local Tax USD 100, alcoholic beverages, special gratuities, phone calls, laundry, or items of a personal nature. The single supplement for this tour no apply you will be charged a single supplement if you desire single accommodations. 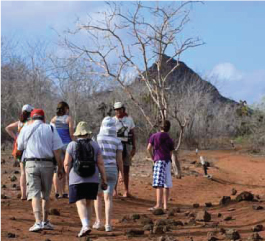 – Galapagos National Park Tax: US$ 100.00. This tax can be paid directly by the passengers (cash only) or can be invoiced and prepaid by KT under request. – Galapagos National Institute Migration Control Card: US$ 10.00. This figure will be invoiced and card will be handled by KT. – Wet suits (US$ 25.00 per short cruise). – Alcoholic and non-alcoholic beverages. – Medical Services, travel insurance and other not specified. TOUR REGISTRATION: To register for this tour, complete the Tour registration form and return it with a deposit of 50% per person. If registering by phone, the deposit must be received within 10 days or the space will be released. Full payment of the tour fee is due 60 days prior to the tour departure date. CLIMATE: Weather conditions can be extremely variable on this trip due to the wide range of habitats and elevations visited. Peru the coast is generally sunny and hardly ever receives any rain, but from April to November there is a heavy sea mist. The highlands have a wet season (October to April) and a dry season (May to September), when the days are clear and sunny but very cold at night especially at altitude. Ecuador’s geography has endowed the country with a variety of microclimates. The coast is hot all year, with a humid rainy season between December and May. In the mountains climate depends on altitude, becoming cooler the higher you go. The Amazon region is hot, humid and wet while the Galapagos Islands are dry with a steady year-round average temperature of 77?F (25?C). Etiquetado destinations, ecuador, ecuador and galapagos, galapagos cruise ships, galapagos island, galapagos island and peru, Galapagos legend, our tours.